Chiropractic medicine aims to improve health by restoring structure and function to the spine and other joints. Stress, accidents, overexertion, or other injuries may cause minor displacement (subluxation) of the spinal vertebra. When a vertebra is displaced, muscle tension or irritation to the spinal nerves can result, causing pain (e.g., neck, back, headache) and impairing overall health. Chiropractors evaluate the structure and function of the spine and its effects on the musculoskeletal and nervous systems. They help to restore these systems to proper function. The chiropractic adjustment is the primary treatment used on the affected spinal and extremity joints; there are various types of adjustment techniques. While giving an adjustment, the chiropractor quickly applies firm pressure with the hand to reduce subluxation and restore movement. The adjustment may cause a painless pop or “crack” as gases release from the joint. Patients often experience pain relief, unless surrounding muscles are in spasm. In patients with spasm, chiropractors may use an alternative treatment (e.g., assisted stretching, massage) before giving an adjustment to help tight muscles relax. 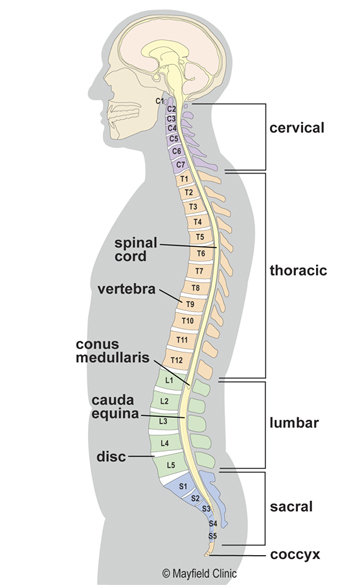 The five regions of the spinal column. Thus, the benefits can be an improvement of the function of the neuromuscular systems and overall health. Without normal movement, discs and joints can degenerate more quickly. Movement can also reduce the formation of scar tissue that can lead to stiffness and joint degeneration. Chiropractors may also care for non-neuromusculoskeletal conditions such as allergies, asthma, and more. Chiropractors design a treatment plan based on a thorough evaluation of the patient's medical history, and/or neurological or medical reports, X-rays, scans, and laboratory tests. The spinal adjustment technique varies to best suit the needs of each patient. Other chiropractic treatments may include any combination of heat or cold therapies, massage, trigger point therapy, electrical muscle stimulation, ultrasound, and nutritional advice. Exercises may be recommended to increase strength, flexibility, and balance, and to improve posture. Licensed doctor chiropractors have completed at least 6 years of college and a clinical internship from an accredited chiropractic college. National and state board examinations are required for licensing. Consult with your primary care or other doctor to determine if chiropractic treatment is right for you. We strive to manage patients as conservatively as possible. Physical therapy strengthens back and stomach muscles. Chiropractic care realigns the spine and releases muscle tension. Nearly 80 percent of our spine patients are able to recover with nonsurgical treatment.